One Piece (Movie) was aired in theaters as a double feature alongside Digimon Adventure: Bokura no War Game as part of Toei's Spring 2000 Anime fair. Story: This OP movie is pretty basic, its a just a treasure hunt. Its pretty decent but nothing special. Animation: Its just the basic one piece style. Sound: Its very good, acoustic music done perfectly. 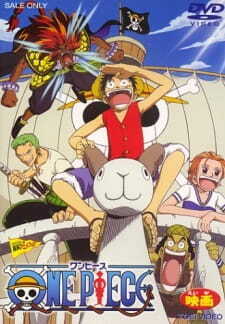 Character: Luffy, Zoro, Ussop, and Nami. Great characters and every thing that is in the show is in this movie. Enjoyment: Decent enemeys and a story about pirates, how can this not be good. The first One Piece movie, I must say, is more like a set of combined episodes than a movie. It does has the "movie feel," in that you can see how the plot is going to move. You know, the gang runs across some seemingly unnecessary characters, whom later turn out to be important to the plot. They arrive at an island, explore a little, the villains show up. Nothing exciting, nothing surprising. The main enjoyment that I got out of this movie, was not the plot or the action, but the characters. Because let's face it, a huge part of what makes One Piece so amazing is its cast. Luffy is just as adorably single-minded as ever ("MEAT! FOOD! TREASURE! "), Nami is still the money-loving woman we all know her to be, completely focussed on what she can gain out of the situation. Zoro, as unconcerned about the apparent "danger" as always, and just as cool and confident as we know him to be. Ussop playing his role with the injection of humour throughout. Basically, their vivid and expressive personalities are what made this movie, well, so intrinsically a part of the One Piece universe. As I've briefly touched on before the plot isn't that great. It's nothing creative, if that's what you were hoping for. If you want something more interesting and inventive, I would skip right to movie four, if you want my advice. But for those of you interested in seeing every One Piece movie out there like I am, then go ahead and watch this one, it's not going to disappoint you. If you're like me, anything with those characters is going to please you, just because I think you could stick that cast in a cardboard box for all the plot you need, and still come out with something entertaining in the end. And after seeing the movie, I'm sure you'd agree: it's still One Piece, at the heart of it. Regardless of lack of plot twists or great excitement. And that's what counts. Do take note of the year this movie was made, so that you won't be disheartened when you begin to see the poorer animation than what you might be used to. I had been watching the late 400s in terms of episodes when I saw this, so it was a shock to me to return to episode 1 in terms of art and animation. But really, it's not awful. If you got past episode 1 of the anime, this art style shouldn't bother you too much. Music is the same as ever, the same battle music, the same great catchy tones that belong to the show. So nothing different there. Overall, this wasn't the best movie, I'll admit. It had the feel of a quick filler more than anything, but I'm a completionist sort of person, and wanted to see everything One Piece that I could. If you're like that too, I'd certainly recommend it, because it still has the same feel as the show. Light-hearted action, Luffy looking badass, everyone cracking jokes. So yeah, watch the movie. I mean, come on, do you even need a review to figure that out? It's ONE PIECE. The first One Piece movie was a bit of a surprise. I went into it, expecting a basic, unremarkable side-story featuring the cast of the show. What I got instead was an entertaining pirate tale which stands on it's own as a movie and manages to be well written on top of that. The characters from the show are in top-form here, all bringing along their trademark personality quirks, and being written just as well as they are in the main series. The new characters that get introduced aren't quite as well written or well designed as the main cast, but they're no slouches, either. I thought they did a lot with the character of Ganzo, despite not having much time to develop him. Ganzo's son is a bit of a standard "Little kid wanting to get into fights" archetype, and the villains they introduce are also pretty standard antagonists. However, all of the characters fit into the story, and it makes things interesting for the duration of the film. The story itself is a pretty simple tale about finding a pirate's lost treasure, and fighting a separate pirate menace along the way, but the way it's presented is very nice, with a decent pace, well written dialogue, and a nice flow between the scenes. There's a few scenes from the film that are pretty iconic and I think will stick in viewers minds long after the movie has ended. There's also a pretty nice message about greed in there at the end, and I think the movie handles it appropriately, only alluding to the message and leaving it up to the viewer to decide their own opinion on it, instead of shoving it down the viewer's throat. The art is really well done. I've been a fan of the art style in One Piece since I started watching it, but it's a real treat to be able to see that art style done using hand-drawn cel animation, with a movie level budget on top of that. The motion has a very nice flow to it, the colors are nice and vibrant, and there seems to be more detail put into the backdrops than there is in (at least the early episodes of) the TV series. Audio is done nicely. With quality voice acting, and a fitting soundtrack for the scenes. The overall audio mix works well, but nothing in it really stood out as super impressive to me. The audio is just an acceptable sound mix, nothing more, nothing less. Overall, while it has it's faults, and there's some parts that make it less enjoyable than the series, I enjoyed this film much more than I thought I would going into it. It's great for both fans of the series and for those who have never seen One Piece before. If you like adventure, action, pirates, or all three, This movie is easy to recommend. The story is fine and simple for an anime movie is was fine and entertaining nothing more to be said he. Seeing that this movie came out about 16 years ago, I say that the art style and animation is definitely great not even the first couple hundreds of episodes of the actually anime look this nice and that's usually the case when you make a movie. This one movie even had a classical 90s feel and animation to it which I liked alot. The sound is great and I've been watching the Funimation Dub of the anime this whole time so this is technically the first thing I've watch from One Piece that is in JP and the JP voice actors for everyone sound great. Now these days I can't sit down and finish a movie in one sitting so my enjoyment reached at least a 7 because of the straw hat crew acting like how they always do and making it and enjoyable and entertaining ride through the entire movie. I think for an anime movie this is a really good first movie and usually when it comes to anime, their first movies are usually like this it's the ones after it that usually are not that good we'll see how that turns out because I'll try to review all of them this one I have to give an 8 because I enjoyed the 90s art style presentation more than anything when it came to this movie. The Ultimate Guide to 67 ONE PIECE Characters!! One Piece has a vast array of recognizable characters, who have multiple names and unique traits. This is the ultimate list of their nicknames and a comprehensive introduction for these 67 characters! !